Which devices will ring is down to each individual user and can be controlled via device management as covered in the ‘Adding and Configuring Phones’ article. 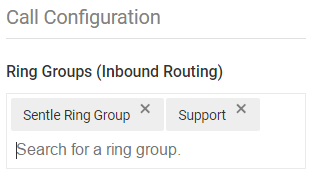 When in the call settings area of the Company Configuration tab select the ‘Ring Groups’ option from the window as shown below. 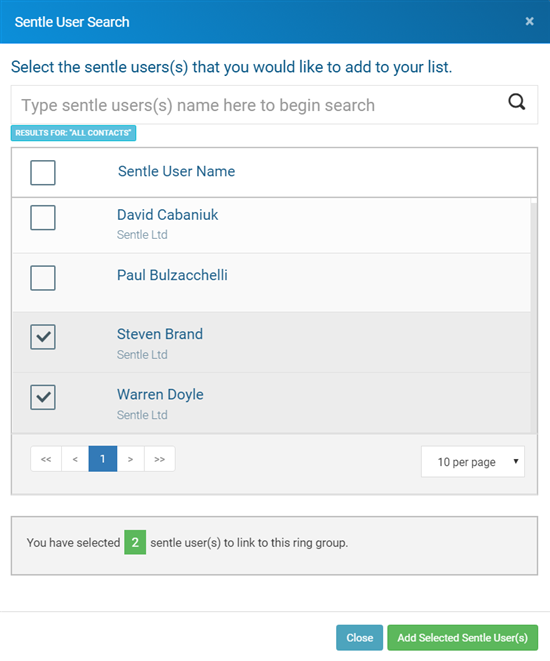 This will take you through to a view of the current ring groups you have set up within Sentle so from here you can either click through to an existing ring group to edit or add a new one via the ‘add new ring group’ button in the top right. You’ll see in the image below that in this view you can quickly see the name of the ring group, who will receive the calls and which number the ring group is assigned to. When choosing to add a new ring group you will be presented with the following window into which you can add the name of the group ‘support’ in this example. Choose ‘Add Sentle Users’ to open a search window like that of when searching for contacts with difference being in this case that only your Sentle users will be available. Once you have highlighted which staff you wish to add to this ring group, press the green ‘Add Selected Sentle User(s)’ button to assign them to the group. Press ‘Add Ring Group’ to add the ring group to the list as below. You’ll notice that the new ‘Support’ ring group has uses assigned to it but has not been linked to any numbers yet. Click on the ring group in the list to go through the settings window for this group. In this screen you’ll see the name of the ring group (which can be changed here) the current Sentle users assigned to the group (more can be added here) and the number/s that the group is assigned to. At present this ring group is still unassigned. Select ‘Go to Numbers’ in the bottom left and you’ll be taken back the main number list as below. To assign the ‘Support’ ring group to a number select which number you wish to use and when in the number configuration page use the ring group section to add the new ring group to this number. Ring groups are treated like tags, so you can either start typing the name of the ring group or click into the window to show those available in the system. The image below shows that this number will now has two ring groups associated to it meaning that when somebody calls in using this number the call will be routed to all Sentle users assigned to those groups. Save your changes with the number configuration screen and it will appear in the number list now displaying the new ring group. You have now completed setting up a ring group and assigning it to a number!